In a medium bowl combine the ground pork with all of the spices. Don’t be afraid to get your hands dirty! Place a skillet over medium heat and warm the coconut oil. Add the garlic, onion, celery, carrots, pecans and parsley. Cook for about 3 minutes, until soft. Set the mixture aside to cool. Add the vegetable mixture into the ground pork and combine well. Use your hands to form golf ball sized meatballs. 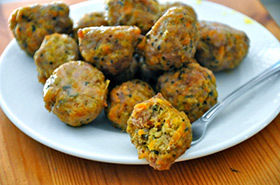 Place the meatballs in an oven-safe baking dish. Bake for 30 minutes, or until cooked all the way through.